The Rebel Sweetheart. : 4 Tips to Keep Your Baby Happy While He is Growing. 4 Tips to Keep Your Baby Happy While He is Growing. Did you know that the happiness of your child doesn't rely on the things you give to him, rather it’s something you teach him? That said, it’s vital that you develop inner tools that your baby can rely on throughout his life. It may sound complicated, but the good news is that you don’t need to be a child psychologist to impart inner happiness and strength. Any parent can lay the groundwork so his child can have a lifetime of happiness. In this post, you’ll find four tips to keep your baby while he’s growing up. They can help you raise a well-adjusted kid and make sure he’ll turn out okay. One of the ways to keep your child happy while he’s growing up is to make him feel that he’s connected to you and the other family members. Having a connected childhood is vital to your child’s happiness. He’ll feel connected when he’s being loved, acknowledged, understood and wanted. These feelings will protect him against emotional distress and risky behaviors. With a secure bond, your baby will trust you, communicate his feelings to you and trust others, eventually. You can foster connection by holding your child as much as you can. Respond to his cries but do it with empathy. Read him a book. Eat or laugh together. It’s also important that your child forms connections with others. The more connection he makes, the happier he can be. Parents who always express negative emotions to their babies are likely to have kids with aggressive behavior. If your child developed behavioral aggression when he’s young, he’d carry it later in life. It would even affect his future romantic partners. To avoid it, try to improve your mother-child bond. Hold your baby frequently to increase oxytocin, which is a hormone related to familial bonding. Scientists found that mothers with increased levels of this hormone during pregnancy tend to bond better with their infants. When he does negative things, never isolate him for poor behavior. Instead, guide him toward positive solutions. You also need to be present all the time while he’s growing up to support your positive relationship with your kid. That’s because your child wants to be with you. 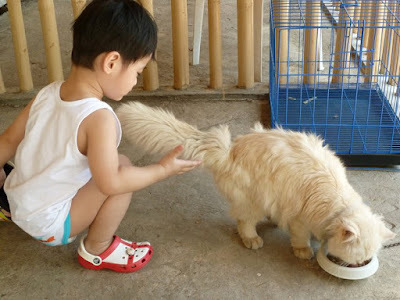 Yue (with my sister's Persian cat) at 3 years old. Sometimes, happiness relies on the feeling that the things we do matter and value by others. When we lose that sense, we feel excluded from the group. What human beings fear most is exclusion. As a person, your child has an innate want or need to be needed. That said, the more you tell your child that he’s making a contribution to his family at an early age, the greater he’ll appreciate his self-worth and ultimate happiness. You can have meaningful family roles at home. One of them is to ask him to refill that cat’s dry food bowl. Or he can set out napkins at dinnertime. Give him a role that’ll improve his strengths. If he likes organizing things, give him a job of sorting spoons and forks. While you acknowledge his contribution to the family, it’ll heighten his sense of confidence and connection, which are vital for lasting happiness. Pick up your baby when he cries. Babies are designed to cry when they need us. So, the faster you pick up your child, the more independent he becomes. He’ll cry less. If you pick him up fast, he’ll grow up to be independent and curious. He’ll also know how to get others to fulfill their needs, making him a competent baby who knows how to explore the world. Sometimes, your child cries because he’s in pain. Pick him up and try to console him. If he doesn't stop crying, look at his gums. He might be in great pain because of his teething. Teething is a common problem amongst babies. Your child refuses to sleep or won’t allow you to put him down. This issue can’t be remedied using infant medications. There are several ways to comfort him when he’s teething and stop him from crying. One of them is the use of amber necklace for babies. Some mothers are skeptical about allowing their children to wear it. However, when you consult other parents, the majority of moms would swear by them. This necklace works because of the succinct acid in it that acts as a natural pain-relief agent. Once your baby wears it, he’ll be as happy and calm as you want him to be, despite the pain he’s feeling as a result of teething. Parenting isn't a one-size-fits-all. The key to keeping your baby happy while he’s growing up is to step in when he needs support based on the clues he’s giving you. As he grows old, he’ll have successful relationships when he becomes an adult. Thanks for sharing such a informative post. it is quite helpful to me. My son is 2years old and such posts are helpful to me. I will sure keep in mind these tips and share with my sister in law also. Good tips indeed. I especially liked the one about giving responsibility, this will instill confidence and develop the baby's personality and independence. That's very well said. There's nothing more rewarding than giving your child an awesome childhood while also learning manners and all the essentials. Wow, so nice tips! We always make sure that our kid enjoys his childhood! These are lovely tips. It is hard to stay positive when things go so tough with kids.